Dental implants are the solution of choice for nearly 500,000 people every year. With such incredible popularity, it’s no wonder why you might be considering them, too. An implant dentist can treat conditions such as missing, broken or decaying teeth by replacing them with a prosthetic that is fused to the jawbone. The office of Dr. Travis Wilson offers affordable dental implants to patients. We can treat patients who need single-tooth or full-mouth replacements, so no matter what level or restoration you require, we can help. Implants are an increasingly popular dental choice for a reason. 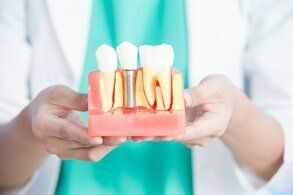 If you are considering dental implants as a solution for damaged, broken or missing teeth, finding a trustworthy dentist is an important part of the decision. The office of Dr. Travis Wilson serves clients in the greater Owensboro area, including surrounding markets such as Morgantown and Beaver Dam. You can also visit our office if you are in need of an orthodontist for braces, alignment or jaw positioning. For more information, please reach out to us at 270-926-6040 and make an appointment.